It could have just been a freak malfunction and accident. Like the helicopter crash in Peru earlier in the week. 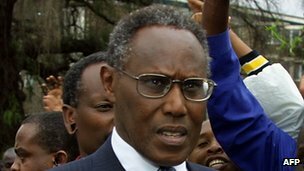 But why do our ears prick as soon as we find out that George Saitoti was a victim of crash. Kenya is still at war. It is easy to forget. Fighting the Al Shabaab in southern Somalia. The war is not fought in Nairobi, it doesn't really effect our day to day lives. Some people may go to the shiny mall less and there are a few more badly trained, badly paid security men around, but that is about it. Saitoti is a security minister. I read in the BBC that he was on his way to a security meeting, but in other sources I read he was on his way to a religious ceremony. Either way, he was a man in the know and controlled the National Security Intelligence Service and he had recently declared that Kenya would not be cowed by 'terrorists'. There will be 3 days of mourning for the two ministers and it is quite clear that the ministers, particularly George Saitoti were very highly thought of and liked. Barely a week goes by without another security waring, of a threats of an attack in Nairobi. These (perhaps too) frequent warnings seem to have the effect of complacency rather than awareness. I have a friend in security who keeps me far to well informed. I texted him on the weekend, jokingly, to say I was touring the Al Shabaab hot spots in Nairobi. (All the places he won't go with me basically. I know- not so funny Mother dear!) Then the strangest thing happened at one of these 'hot' cafes. A man with earphones silently stood up and moved around the cafe with an open magazine (it was Vogue by the way!). Once I had noticed the strange behaviour I couldn't ignore it and I couldn't relax either. Neither could others. Somewhere else you may pass someone off for being drunk or possible mentally ill. I normally do, but think I have been told too much. It was time for me to move on. Security in Nairobi is an issue, I think (I think) it will have to get worse before it gets better. I'll share theory 2 another time. PS- Hello readers in Russia. You seem to be my biggest fans...yet I have no idea who you are. Don't be shy. I am so ignorant with other countries issues, but it seems we all can the common denominator - power is evil. I am really starting to get scared of our world. Your last comment is funny! I noticed that my top countries for pageviews are also USA, then Russia! What the heck? Also, yours doesn't come up on the list. I wonder if your server is not in Africa according to blogger? Kyria- I was wondering if the translation of my blog is VERY funny is Russian...who knows??? Strange mine doesn't come up...just think we may have LOADS of other readers then..!